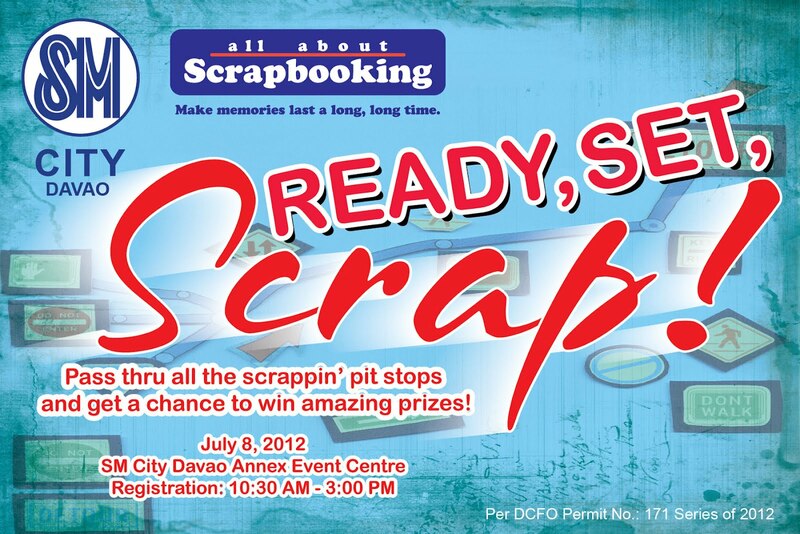 It's a race to the finish line as All About Scrapbooking and SM City Davao team up to bring you READY, SET, SCRAP! 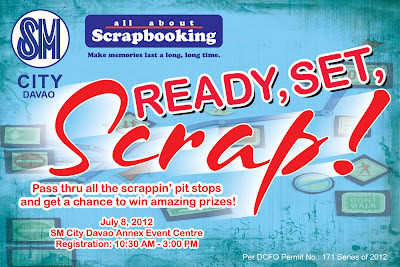 Scrapbooking Competition on July 8, 2012 at SM City Davao Annex Event Centre. Show off your creativity in the “Hello Sunshine” and “Heart and Home” pit stops and get a chance to win amazing prizes! Your mission? Create scrapbook pages or projects per pit stop following a set of instructions and using the materials provided in the competition kits worth P200 only. Don't forget to bring your photos and scrapbooking tools. All participants will receive a special gift pack upon completing each pit stop and a stash of scrapbooking supplies. Six lucky participants also have a chance to take home exciting prizes from All About Scrapbooking, Hallmark Cards and Bic Writing Instruments. So for all thrill-seeking scrapaholics in Metro Davao, this is your perfect moment to rev up your skills and win! Registration starts at 10:30 AM.